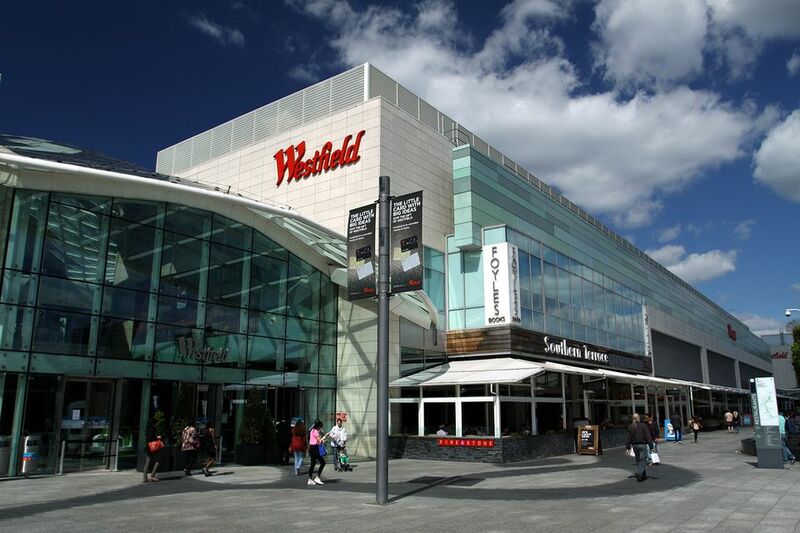 With more than 43 acres, spanning nine postal codes, the Westfield London shopping mall in the Shepherd's Bush/White City area is one of Europe's largest shopping malls—hands down, the largest covered shopping center in London. Westfield London features 360 stores from high-end shops like Louis Vuitton and Armani to edgy trendsetting boutiques and usual mall favorites like the Gap and Sunglass Hut. There are 60 places for food and drink, a movie theater, bowling alley, casino, and Kidzania, a giant child-friendly city for children's "edutainment." Some would definitely say this parcel of land has been restored to its former glory buttressing an area of London that had slumped. The construction of this major shopping center rejuvenated the local area through the improvement and expansion of a key transport hub. On the exact site where the 1908 London Olympics Games were once played, as well as the Franco-British Exhibition the largest fair that London had ever hosted—time had not been kind. Over the years, the land's stadium and majestic halls were repurposed as a railway depot that turned derelict in this section of west London. Then, 100 years later in 2008, the Westfield Group swooped down to open this behemoth shopping emporium to the tune of $2.2 billion. For tourists who visit a city with shopping in mind, then Westfield London is your one-stop-shop. You can find haute couture among the 35 boutiques in The Village like Prada, Burberry, and Tiffany & Co. The luxury shopping experience does not stop at clothes. The Bentley Studio and Tesla store allow you to experience their cars in the showroom and for a test drive. Fashion-forward shopping in London does not have to break the bank and does not start and end at The Village. There are more than 300 stores—fitting many types of lifestyles and trends—from H&M to European fashion chain, Lindex. To check out London's top shops for women's fashion stop in at stores like Debenhams and House of Fraser. Most specialty stores you would expect to find in malls throughout the U.S. also have a home at Westfield London: Coach, Nike, the Apple Store, MAC, Lush, and Lululemon. In one week, it is not unusual for the Vue Westfield London movie theater to feature 30 titles. The Vue Westfield has 17 screens, showing mainly mainstream movies. Seven of the screens are 3D-enabled, while there are three luxury scene screens, which equates to more expensive tickets for upscale seats. There are two VueXtreme screens that are IMAX-style screens. Aspers Casino Westfield Stratford City, the biggest casino in Britain, is open every day, all day, except Christmas Day. The casino is a 65,000 square-foot complex that features 40 roulette and blackjack tables, 90 electronic gaming terminals, and a 150-seat poker room. So you never leave, there are a "fast-casual" restaurant and two bars, one of which is next to an enormous screen with betting facilities, and 150 slot machines, flashing and dinging constantly. KidZania is the UK’s first educational entertainment experience where children aged 4 to 14 can learn real-life skills in a 75,000 sq ft. kid's world scaled down to size. There are 24 KidZania centers worldwide with the first two slated to open in the U.S. in Chicago and Dallas by Winter 2018. While you shop, your child can work on a car assembly line, move furniture, or put out a fake fire with real water. By doing a job, your child gets paid a salary in "kidzos," a currency that can be used in branches around the world, or deposited in the central bank and accessed with a realistic-looking debit card. Children can spend their kidzos to go on the indoor climbing structure or at the mini city’s department store, which is stocked with covetable trinkets. Westfield London is one of two Westfield malls in London, the other is located in Stratford City. The Westfield Corporation is no stranger to the U.S., the corporation owns and operates 32 shopping malls in the U.S. in 8 states, including a mall at the reconstructed World Trade Center in New York City. A Westfield Gift Card makes for an easy gift that can be used at hundreds of stores that accept Maestro in both the Westfield London and Westfield Stratford City malls. Retailers process Westfield Gift Cards in exactly the same way as any other credit or debit card. Westfield Gift Cards are available from Westfield Concierge desks and online.